racketboy.com • View topic - Sacks for controller/remote storage? I'm thinking instead of big plastic bags or something, maybe some kind of sack would be a better idea to slip controllers and remotes into? I have a set of plastic shelves like this, but dust always gets in them and the controllers get disgusting pretty easily. So I wonder if this would be an easy option for keeping them cleaner? Looking up sacks on Amazon doesn't really help much haha, maybe you guys have some specific suggestions. I know I've seen some people use some for this sort of thing in game room tours and stuff. What I have seen some folks do is buy a bunch of Ziploc storage bags, quart and gallon size, and put all their accessories (not games, though) into the bags. So controllers go into bags, cables and adapters into bags, and then the bags into the plastic bins. Another thing to pay attention to is maybe you have WAY too much dust in your environment if you're getting significant dust in your drawers. Consider getting better filters on your air intake and vacuuming more often. I have asthma and dust/vacuum weekly along with monitoring humidity levels, so I'm meticulous about all that. I think it's just the shelves being crappy. I could maybe ditch the shelves, though I do like using the top of it for my clock and some stuff... and it's easy access to grabbing controllers. I've done ziplock before for some stuff and that was the idea I was thinking of. Just kind of wondered if some cotton based sacks or something else would maybe be easier to handle instead. Updated the title to reflect I'm mainly looking for controller/remote storage options that are easily accessible to grab right away, if anyone has other suggestions. Re: Sacks for controller/remote storage? Cotton sacks would be permeable and typically have drawstrings, so I don't know that they would be any more quickly or easily accessible. 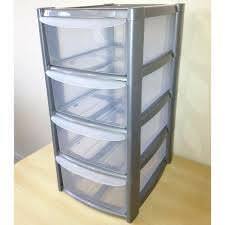 What about a metal or plastic filing cabinet? Those tend to have smaller openings, so less dust would get in. You could use some sort of arrangement of trays to arrange things in the drawers. Ziploc bags are gonna be your best bet. They're just as easy if not easier to handle than drawstring bags, but they're much cheaper and clear. Having clear bags will make it more convenient to pick your controller. If you're only using the top to set a clock then you don't need to be married to those shelves. If you don't need the shelves to be clear maybe you can get a nightstand with a couple drawers? I personally use clear latching storage bins for all of my retro systems and controllers. They stack easily on top of each other and store safely in the closet. I know some people like to have them all displayed but it’s not really an option for me right now and the latching bins do a great job of keeping the dust out. I recommend them at least for the controllers since you’re not really displaying them now anyway. I can’t really imagine ziploc bags being easier than them.